The hybrid of frontier western and science fantasy fiction, remains an underrated sub-genre. What comes to mind are some alternative pop-culture hits with deep world-building, raising to earth somethings believable and exciting; using the old frontier time period as an influential backdrop. The result is storytelling with a lot of freedom, and heightened danger with the occasional dose of social anarchy. Examples of such include Joss Whedon’s TV show Firefly, the manga/anime Trigun, Weird Western Tales comics with Jonah Hex, the Bravestarr cartoon. 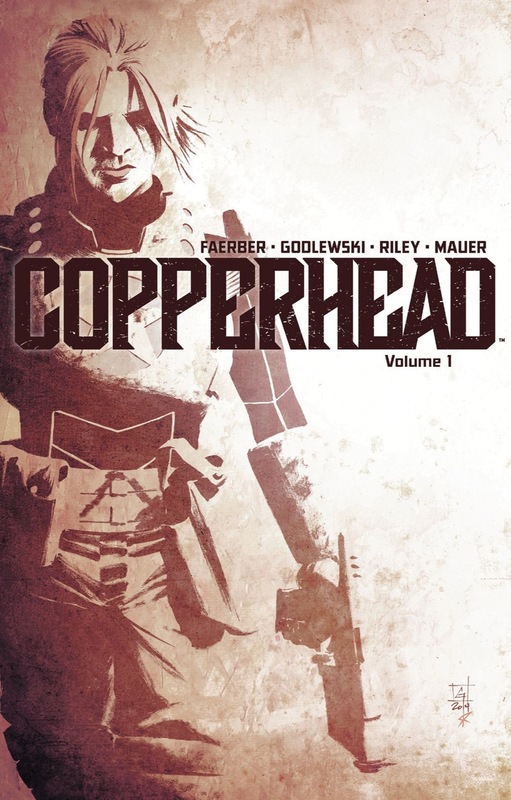 Copperhead is a wonderful, fresh addition to the sub-genre. 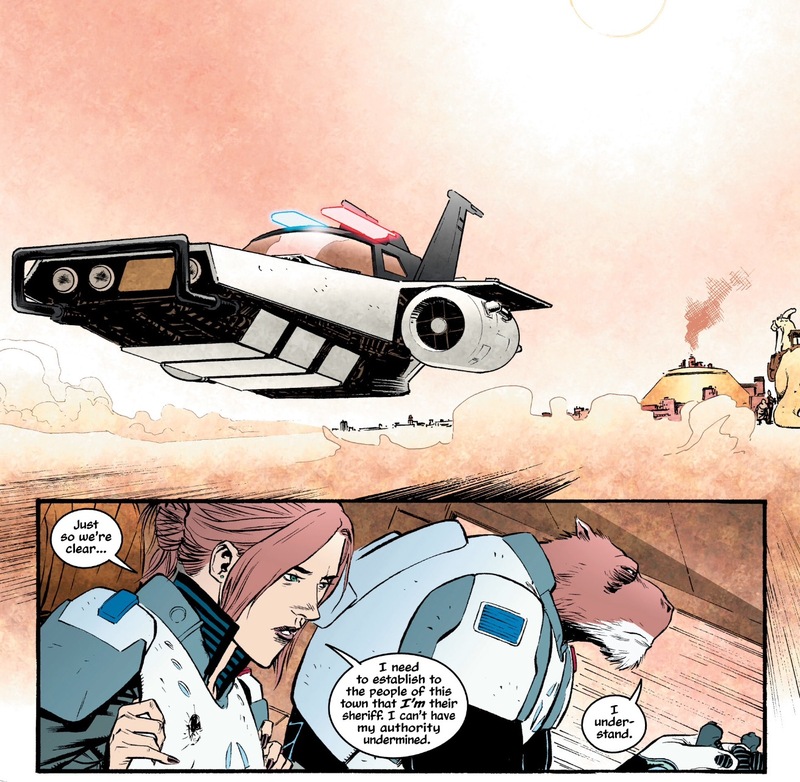 Copperhead delivers the greatness of fantasy western futurism, with a fresh approach. We have an overall new planet to explore, where native elements benefit and endanger. We have outside elements, that must adapt and change. Such includes, the spectrum of humanity and inhumanity across a variety of sentient beings. Nothing seems too weird, once we accept this new world and its familiar tropes of classic genre storytelling. Yet. the odd alien variety and added retrofuture tech gives it all, a heightened approach. Then we have our heroine, Clara Bronson..
She is a badass. It takes heightened bravado to slug a big, hefty giant-eyed alien. What’s more for Clara, is that she is not some high plains drifter, as often stereotypes do in these frontier fantasies. Clara is the new sheriff for a small very distant town, and a single mother; both demanding responsibilities to take on. Her attitude is fearless, to the point to the point of feeling confident she can take on both.But, there are challenges as we soon see from the first issues, where she will have enemies and new dangers to face. It’s exciting for us readers to sort of live through her, and the high stakes both domestic and outside. A fresh start is in story for her, and us readers. The supporting cast is a campy sort any local yokel can cheer for. We have the furry giant deputy with a somewhat gentle spirit by the name of Budroxifinicus (Boo for short, but he would rather you didn’t). We have Clara’s son Zeke and his new friend of similar age, Annie. Together they look for a missing dog, which leads to new characters, and more danger. Also, we have the concept of the “artificial human” with a new character, Ishmael; which brings back some interesting moral dilemmas and speculations. Along the way, the cast (especially Clara) must come to an understanding what this environment brings and that violence is not always the best solution to solving problems. However, not all is good fun. There is murder, with some violence and gore. We have a murder mystery, with interesting interventions and plot twists. The pacing is good as the puzzle kept me guessing, entertained. The result has heart, and a strengthening of the main character as a sheriff and a mother, as she must also use both developed instincts to bring about resolution. 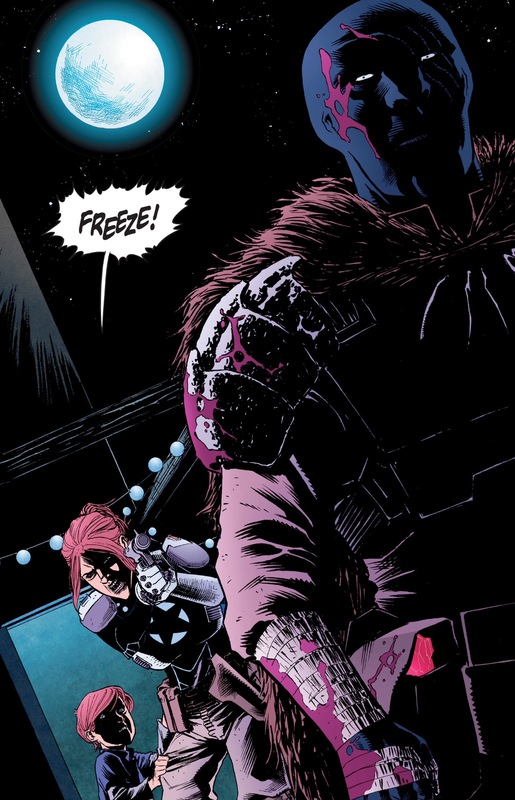 Scott Godlewski’s art has great style, and well done for this series. The pencils are simple, but show great emotion where needed. The environments remind me of planet Tatooine (Star Wars) where recycled technology and structures made with whatever works gives practicality, and the beauty of living a simple life, no matter the situation. The coloring by Ron Riley is also superb, and a perfect complement to the art within. We have lots of earthly tones during the day, with the natural effects one could expect in a dusty, heated open land. The night brings some nice moonlit tones, mixed with dramatic shadings; a nice addition to the drama and intrigue for the story. Overall, the first volume gives lots to look forward to, with an ending hinting towards more drama and action. 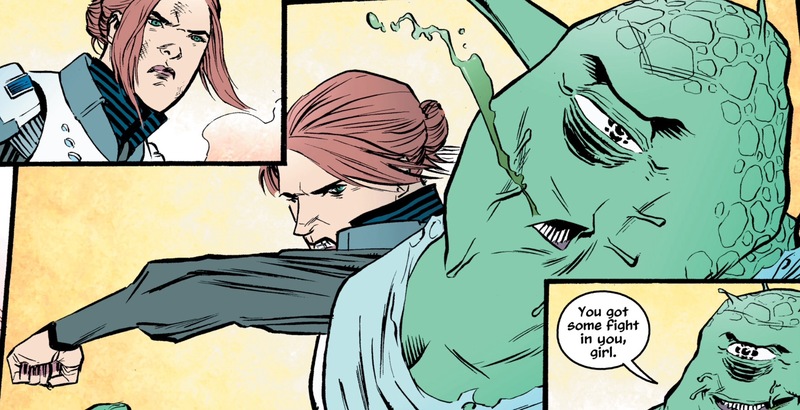 Copperhead feels deserving, matching a TV show with at least six seasons. Check out the first volume, for a good casual read and escape into some great frontier fantasy.